Formed in the spring of 2000. Drummer, Chico, and bassist Kit had been performing together for several years beforehand and through a Captain Beefheart connection Chico, sensing a good fit asked saxophonist Alonzo to come rehearse with them. In a free improv session out in Kit’s barn the chemistry clicked, and they never looked back. With a common interest in free improv jazz, obscure world music, 1960’s Italian soundtracks, outsider music and fellow new music performers we have developed, between the three of us, a common musical base. A fluent lingua-musica that allows us to create performances by conversing in this language. Because of this intuited communication our spontaneous compositions often come off sounding like rehearsed written pieces, when in fact they are made up on the spot. The sounds in our performances range from quiet textural sonic atmospheres to fiery aggressive free-jazz. Out-bop is a coined term meant to point in two directions. One to the past and to bebop and one to the future and out/outside-beyond music. Bebop is the resurgent modern jazz movement of the late 40’s early 50s that was active among a small cadre of musician who longed to make music that was vital and new. They felt no urge to appease popular sentiment, actually quite the opposite, as they purposefully made music to challenge their audience. Bebop was urban and gritty and streetwise. It was also technical and difficult to play but for the initiated. It’s a curious historical note that jazz critics of the time maligned these innovators who are now lionized by the current jazz establishment. You won’t find the technical musical notation of bebop in our music (except in occasional quotations or in mutant form) but we very much aspire to the energy that inspired that original art form. They created because they were driven by their artistry and kinship and commitment to a new musical form. The ” out” of out-bop can be taken as a variety of flavors. It can be Outrageous or Outsider. But mostly it refers to the avant-garde which by definition is always ahead of the mainstream and hence outside of it. Out-Bop, put together is music that reflects on jazz improvisation roots,not in an academic-repertory way, but in an artist-energy way and throws it into the flames of the future where it is incenderized in an air of mystery and awe. In the 60’s it was The New Thing or Fire Music today it is Out-Bop. Aka Frank Turek (Saxophones, wind synthesizer) has been active in the Portland music scene for the past fifteen years; co-founder and artistic director to Portland’s original surf instrumental band Shutdown 66, originator of the circus jazz, avant schmaltz sax and drum duo The Clown School Dropouts as well as a four year tenure as organ player for the sixties garage sound band Lady Kensington and the Beatlords. Currently he spends much time working on his art assemblage pieces at his studio space in Portland. He can also be seen on the street in the guise of Cranky, the Clown School Dropout playing his signature straight alto saxophone. Cranky on Facebook. Kit (upright bass) has studied physics, jazz, and classical music performance privately and in college, and played bouzouki in the Greek band Opa Opa. 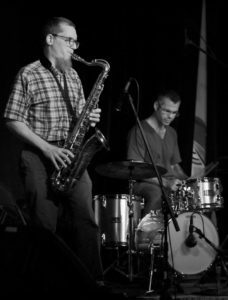 He has been performing and recording with free jazz/free improv guitarist Jeff Platz in the northeast USA and Europe. 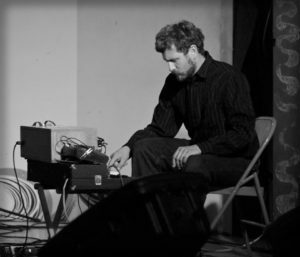 Outside of performing, he currently teaches high school chemistry and physics, tutors math, and has been swallowed whole by a passion for analog music synthesis which he incorporates in Mystic Out-bop Review performances. 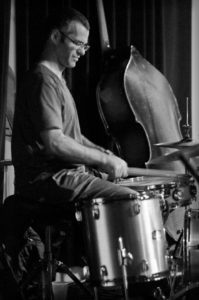 Aka Francesco Sanfilippo (percussion,drums) has played in Portland, ME with avant-rock groups black tara, Chiasso, the trees, and The Mandrill Pedestrian Expedition and more recently a part of the free jazz Bright Light Group. He also plays with the standards-based jazz group Bright Lights (no relation to the aforementioned, Bright Light Group), and Ocean Sol Jazz. Chico gives drum lessons and presentations on the the history of drums and produced. He’s released two CDs, maestro Toto’, involving various local musicians, and Hipstrumental. He also teaches and practices Nonviolent Communication as developed by Marshall Rosenberg and is a Shambhala practitioner. Chico’s side-projects can be heard at his Myspace page, hipstrumental .